A three-ply cord, twisted tightly enough to be a cable style cord will stay nicely rounded at the neck. It is styled to be worn right at the base of the neck or slightly lower. 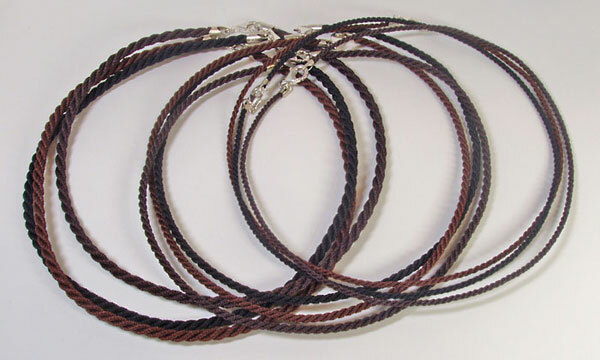 The cords are made by hand with nylon thread with sterling silver end caps and a 7 x 13mm sterling silver trigger clasp. Choose the color, Black, Chocolate or Brown, the diameter, 2mm, 3mm or 4mm and the length: 16" (40.5 cm), 18"(45.7 cm) or specify.